Uber has been given free rein to violate basic employment laws with impunity. We have to stop them. The union represents 21,000 taxi and other for-hire vehicle drivers and recently scored a major victory over Uber, passing legislation capping the number of for-hire vehicles on the city’s streets — an affront to those who put their full faith in the benevolence of the market’s invisible hand. Founded in 2009, the company has risen to become the poster child for the gig economy and capitalism’s promise of innovative new technology upturning the status quo. And yet, everywhere Uber meets resistance. Taxi drivers have organized strikes and other disruptive actions in Australia, Brazil, England, France, and Spain. Out with the old, in with the new — except there is nothing particularly new about Uber. Uber has a reputation for many things: a sexist corporate culture, evading legal authorities at home and abroad, bribery of foreign officials, paying hush money to hackers, and corporate espionage. Uber’s most undeserved reputation is that it’s a technology company. It’s not. According to Uber, the company is only an intermediary, connecting through the app consumers looking for a ride with the people who happen to be selling one. As such, Uber claims that drivers are “independent contractors” — self-employed service providers. Misclassifying drivers as independent contractors and not employees allows Uber to weasel out of billions of dollars in costs, such as paying a minimum wage or overtime, providing health benefits, making Social Security and unemployment fund contributions, or paying payroll taxes. Evading necessary social payments, taxes, and the entire employment relationship provides Uber with an incredible competitive advantage against rivals — with the costs borne by drivers. After expenses are paid and Uber receives their cut, the company’s drivers are earning less than 90 percent of what other private sector workers in the United States make. This highly lucrative and exploitative misclassification scheme is built on sand. There is a fundamental contradiction between the claim that drivers are independent contractors and the amount of quality control that Uber exerts over drivers — control that is central to its brand identity and valuation. Essentially, Uber is dispatching drivers, just like many other for-hire vehicle companies have been doing in cities across the country for decades. Yet according to Uber and Lyft, workers magically transform into independent business operators when they are dispatched through an app, rather than over the phone or by radio. That is the highly profitable, self-serving argument that Uber and other tech companies make. And until now, they’ve largely gotten away with it. The Wage and Hour Division of the Department of Labor employs an “economic realities test” to establish whether a company is misclassifying a worker as an independent contractor under the Fair Labor Standards Act, the New Deal-era federal legislation that regulates most employment in the private sector. “Do you control your own pricing? Are you able to control your own profit and loss? What is your capital investment relative to the enterprise? Can you be a self-standing entity separate from the organization for which you are doing the work? Those are the kinds of questions that are part of the economic realities test,” said Weil. There is no economic reality to Uber drivers operating their own businesses independent from the company, but that is the political fiction that Uber has been able to maintain. There is little wonder how. Uber is backed by some of the most powerful firms on Wall Street, such as Goldman Sachs, Morgan Stanley and BlackRock. According to a recent report from the National Employment Law Project and Partnership for Working Families, Uber and Lyft together employ more lobbyists than Amazon, Microsoft and Walmart combined. Uber is aiming to make a highly anticipated initial public offering in 2019. Billions are at stake. But thanks to the raucous organizing of taxi drivers around the world, the Uber myth is beginning to implode. Following actions by taxi drivers in Barcelona, the European Union’s Court of Justice ruled that Uber is an app-based taxi service, not a tech company, and should be regulated like one. In London, Uber’s largest European market, an employment tribunal ruled that drivers are not independent contractors but workers entitled to minimum wage protections and holiday pay. Likewise, the New York State Unemployment Insurance Appeal Board ruled that three members of the Taxi Workers Alliance that drive full-time for Uber are employees eligible for unemployment. 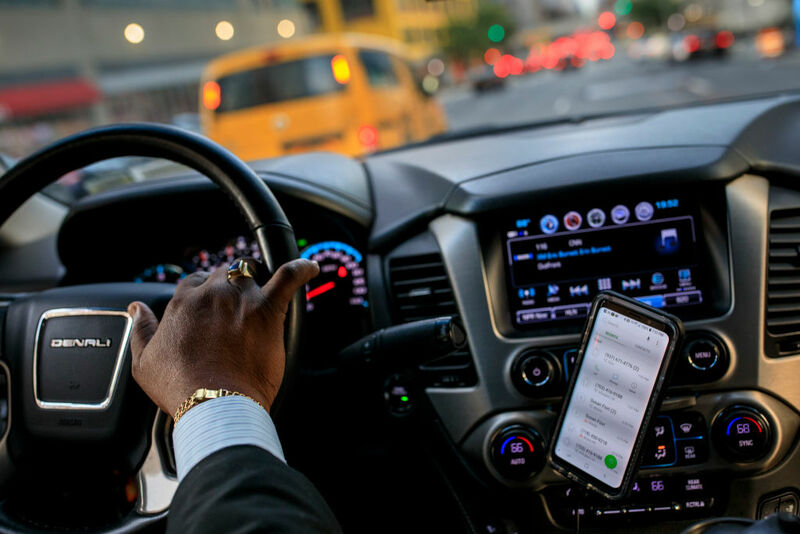 The ruling applies to all “similarly situated” Uber drivers and the New York Department of Labor now has the task of auditing the company to determine how much it owes in missed payments due to misclassification. Far from protecting an anachronistic industry from innovation, taxi workers and their unions are simply asserting their rights and demanding that companies like Uber not be given free rein to violate basic employment laws with impunity. Much like Uber’s technology, the rhetoric surrounding Uber and the “future of work” is over-hyped. According to a recent study by the Economic Policy Institute, less than 1 percent of all workers are participating in the app-based gig economy. “In our assessment, in any conference on the future of work, Uber and the gig economy deserve at most a workshop, not a plenary,” wrote the report’s authors. Gig work is a small part of the overall economy, but Uber does play a much larger role in the life of New York City, which is the company’s largest US market. In fact, according to a recent report from the New School’s Center for New York City Affairs, Uber would be the largest for-profit employer in the city — if drivers were recognized as employees. Providing rides on demand requires flooding the streets with drivers. There has been an explosive growth of app-based drivers in New York City — from 25,000 in 2015 to 80,000 in 2018. According to the New School report, more than two-thirds of those drivers are working full-time and spend between 25 and 30 minutes of every hour driving around empty. As a result, 85 percent of them don’t even make a minimum wage after expenses. On top of that, this glut of drivers has added to congestion in one of the most traffic-jammed cities in the world. Uber’s business model isn’t based on new technology, but corporate greed and worker exploitation that has been aided and abetted by a political system that has failed to hold the company accountable to basic employment standards. In New York, that is starting to change. The Taxi Workers Alliance’s industrial organizing approach to taking on Uber is working. The one-year cap is just the beginning. The union is now organizing to establish universal standards in the industry: setting the fare charged by taxis as the floor and mandating that all drivers receive at least 80 percent of the rate charged or initially quoted — whichever is higher. This would lay the groundwork so the city’s 100,000-plus drivers in the taxi and for-hire vehicle industry can collectively negotiate rate increases and other regulations that benefit drivers over corporations and their Wall Street investors.